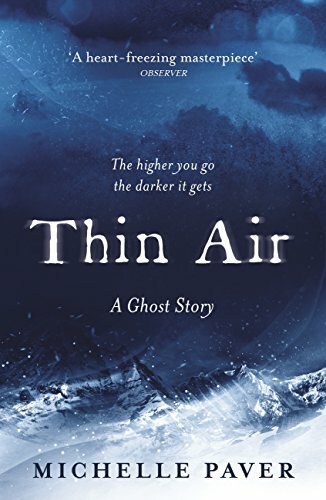 Thin Air by Michelle Paver is a ghost story that takes place over the course of a British expedition to reach the summit of Kangchenjunga in the 1930s. The narrator, Stephen, is part of a small team of British climbers led by his older brother Kits, with whom he has little in common. Stephen is also the team's doctor, and the team is supported by a large contingent of Sherpas who act as porters and guides - and indeed, without whom the expedition wouldn't be possible at all, although you wouldn't guess this from the patronising, dismissive and outright racist attitudes of the British climbers. The team are following in the footsteps of a previous, failed attempt at the summit by an Edwardian group led by a man called Lyell, who went on to write a book about his doomed expedition which Stephen and Kits both read as climbing-obsessed children. Kits is gung-ho about the journey to the summit, but as the ascent continues, Stephen becomes increasingly uneasy as he senses an oppressive, malevolent presence on the mountain and begins to see a dark shape moving on the crags above. Thin Air is, like Paver's previous ghost story Dark Matter, a truly frightening ghost story. Something of an outsider in the group and deeply resentful of Kits - who despite being less intelligent than Stephen is far wealthier and more successful and something of a bully - Stephen is horribly isolated in his fear and terrified not only of the dark presence that plagues him but, as a doctor, also of the idea that he might somehow be losing his rational, scientific grip on reality. The terror that unfolds is oppressive and, despite the scale of Stephen's surroundings, inescapably claustrophobic. It's often vague and a lot goes unsaid, which for me is always more unnerving than detailed description. It's the sense of fear itself and Stephen's powerlessness that are the truly frightening thing here. The descriptions of the Himalayas themselves are also powerfully evocative. The story is also fascinating on the subject of such expeditions and the attitudes of those who took part in them. The white men on the expedition are essentially gentlemen-adventurers. They are privileged enough to be able to undertake such challenges as amateurs and are disdainful of anyone who might dare to be a professional - thus effective denying anyone other than the wealthy a chance at taking part. They are believers in Empire and their treatment of the Sherpas is, needless to say, appalling. Intellectualism is scorned - indeed, it's Stephen's academic nature that's been the cause of friction between him and Kits for most of their childhood. However, the experience of reading this book if you've already read Dark Matter is an odd one. Thin Air isn't a sequel to Dark Matter in any way - but they are strikingly similar. The plots are almost identical and the protagonists are very similar. In both books, we have a narrator joining an adventurous expedition in the 1930s (in Dark Matter, it's a polar exploration trip to the Arctic) and being somewhat on the fringes of a group of wealthy ex-public schoolboys, feeling like an outsider. In both books the expeditions are fraught with bad luck and in both books the protagonist becomes aware of a malevolent and implacable presence that creeps ever closer. In both books the protagonist has a dog and in both books, snow, blizzards and extreme cold are a key element of the setting. In both books, the main character finds himself unexpectedly alone and disorientated by losing track of time, unsure of his own mental stability. That's not to say that Thin Air isn't a good book - it is and I loved it. But rarely have I read two entirely separate books by the same author that are so alike that one seems almost to be a retelling of the other.